While Mongolia appears to have enough water to meet the needs of its cities, industries and farms, it faces a complicated water future. Extremes in seasonal runoff, local stress and chronic deficits threaten economic development in key sectors. Rainfall varies widely across regions, leading to dangerously high groundwater dependence. The steppes make cross-country water conveyance difficult and costly. Climate change multiplies stress, with an 18% increase in heavy rainfall in humid areas and shrinking ice cover elsewhere. Groundwater is no longer recharging and flows are deteriorating in the Khurkh and Onon Rivers. The capital city, Ulaanbaatar, runs short during winter months and suffers from pollution. Strong water demand by mining industries in the water-scarce Gobi region is another complication, while urban water supplies and rural food production security are becoming vulnerable. In the coming two decades water demand is expected to triple even as water supplies are shrinking. The President of Mongolia invited the 2030 Water Resources Group to help find a path toward water security in his country. We have since conducted an 2030 an initial analysis (prior to signing MOU), set up workshops and facilitated discussions to raise awareness of water issues, increase the desire to collaborate, and set a path for action. In October 2013, the 2030 WRG initiated a “Targeted Analysis on Water Resources Issues in Mongolia” (covering both Ulaanbaatar city and South Gobi regions) which was jointly undertaken by a team of experts from PwC and Deltares. Based on the findings of the Targeted Analysis on Water Resources Management Issues in Mongolia, 2030 WRG and the Ministry of Environment and Green Development (MEGD) decided to build up a Multistakeholder Platform. More information on our work in Mongolia is detailed in the sections relating the 2030 WRG’s country-specific partners and approach. With the establishment of the 2030 WRG Mongolia partnership, our first effort was to compile data and information from across sectors. 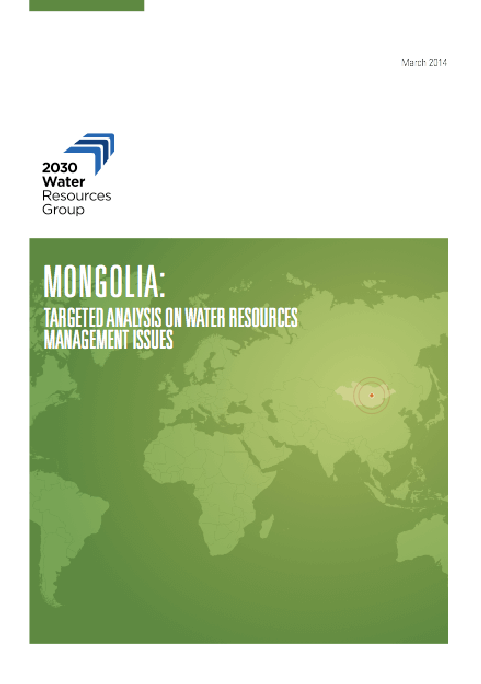 A targeted analysis of Mongolia’s water challenges commissioned by 2030 WRG and executed by PwC and Deltares also mapped opportunities to subsequently raise awareness, mobilize, and engage ‘new actors’ from the private sector and civil organizations in Mongolia to engage in sustainable water activities.